Everyone dreams and loves to have them come true. The young music icon from England, Ed Sheeran is feeling himself lucky for living his boyhood dream these days. The guy appeared with his single "The A team" in 2011 and since the time, he never looked back. That all indicates having lots of magazine interviews but the most significant moment for Ed-Sheeran was when he bagged the cover of Q's Awards Special Edition. Speaking of his excitement, the British singer wrote on Instagram that his boyhood dream of appearing on the cover of his most favorite magazine had come true. Ed-Sheeran also attached the picture of the magazine's front page that reveals him wearing a black jacket with leather panels and holding an acoustic guitar. Having the crop of his unusual cherry hair tousled, the star gazed upward in a dreamy look as if he was pondering on the words of his new song. The publication front page published his name in red, with an amazing quoting that said "an everyday story of one man, his guitar and global superstardom". The good thing is that all the success in the pocket of the young songster, doesn’t let him go away from working for good cause and he keeps putting his popularity to make things possible. Ed initiated the movement of 'the No One Turned Away that was formed by charity Crisis urging the UK government to give a second thought on their policy to help single people without a roof over their head, and come up with a better approach. 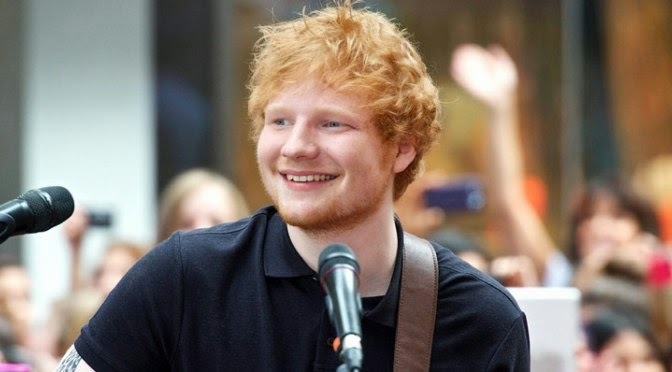 According to Ed-Sheeran, while he was volunteering at Crisis, he came across people who'd been forced to sleep on the streets. He said that he signed the drive because he believes that being on the streets without a shelter can be a horrible experience and no one should have to suffer from this. Ed-Sheeran expressed his views while he was returning from a visit to a centre in Newcastle, United Kingdom a few days ago. “The system today fails homeless people. We have to demand change for helping every homeless person get what he/she needs as a safe haven. ", Ed-Sheeran added.